Having computer issues like system crashes, failed booting or bad performance? This is possibly the case of faulty RAM or hardware incompatibility. To rule out the latter factor, you need to check the specification of your original RAM card and compare it with the one your purchased. More often than not, however, it is necessary to diagnose the RAM card for stability and performance issues. That’s why you’re suggested check out the best 4 free RAM test software for Mac and Windows 10/8/7 in this article. The common symptoms of faulty RAM are beeping of PC, getting overheated unnecessarily and not working up to the desired performance marks. So, if you are facing some real issues, then you should look after them before they cause any problem or loss for you. First of all, RAM memory cards are made with a perfection and quality by the tech companies. So, if you have purchased RAM from a low-level company, then there is a very high probability that RAM is a defective. Always purchase computer peripherals from named brands of this field like Samsung, Kingston, Corsair, etc. There is also a chance that your PC is loaded with outdated processing drivers and chipsets. So, kindly upgrade them to their latest version to use new RAM chip in your PC. There is also a probability that the CPU coolers of your PC is not working properly which results in the overheating. Please check the CPU coolers and if they are not working properly. Incompatibility of PC’s hardware with the RAM chip may also raise this issue. Because users just purchase RAM of higher memory without analyzing the hardware compatibility of their PC with it, that’s why this issue rises. Another very common issue is the lack of knowledge among the users. Sometimes, users insert the RAM chip in the wrong slot which results in this issue. Make sure to insert the RAM chip inside the slot which is reserved for it. Pro tips: Special attention should be given to the above factors, otherwise data loss could happen once there is system error. If you have unluckily lost precious files, don’t hesitate to use Jihosoft File Recovery Software to recover lost files from Windows 10 or Mac. This is a Microsoft homemade utility since Windows Vista and now still pre-installed in Windows 10. Actually, Windows Memory Diagnostic tool sometimes automatically run the memory check process every time it detects any error or complexity in the memory management. But you can manually check for the memory to detect the error. 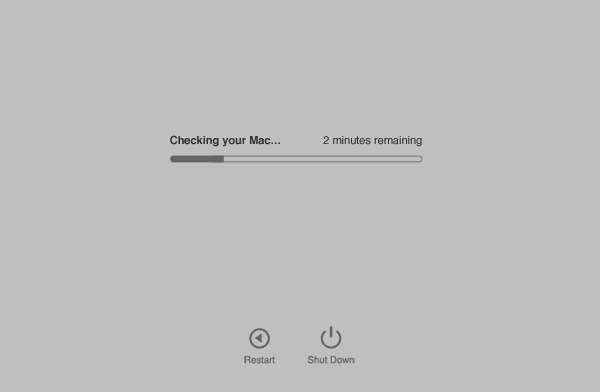 It might take up to several minutes, but once the error is detected, it will automatically fix the issue if possible. After the scan process is completed, the Windows will automatically get restarted. 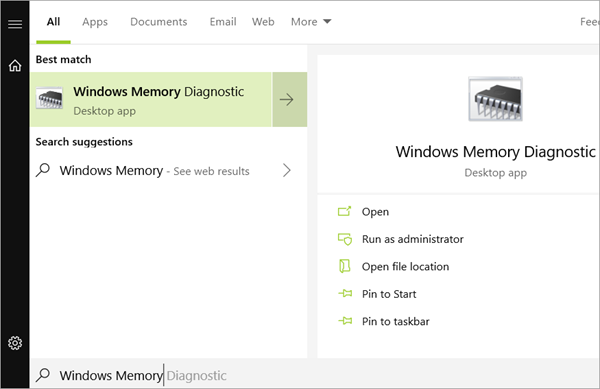 To run the memory check process manually, you have to type “Windows Memory Diagnostic” in the search box and then press Enter key. As we mentioned, once the scan process starts, it might take several minutes to finish the things off. So, just be patient and let the errors in the memory to be fixed automatically. This memory diagnostic tool is available for a variety of OS for PC. PC’s with Mac, Linux and Windows OS can use this tool for checking the memory. This is an open source tool which simply means that this tool is available for free for all users. This tool is very compatible and reliable to use because it supports all the latest technology versions like 64-bit processor, GI, XMP, Self-booting from the USB drives or flash drives etc. That’s why it becomes important to note that every time use this tool to check the memory errors, it takes a lot of time. Another main advantage is that this tool thoroughly checks all the points and runs a variety of tests so that there will be no error left. 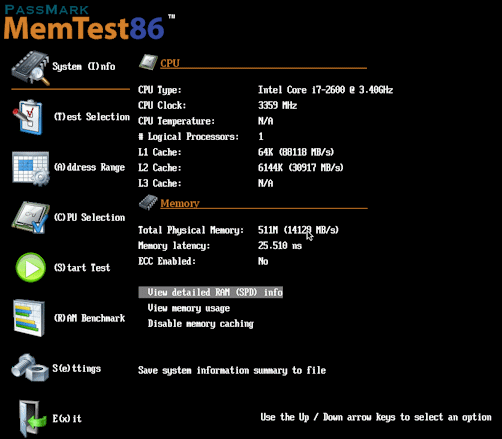 And that’s why Passmark Mem Test86 is a very good tool to check memory errors. 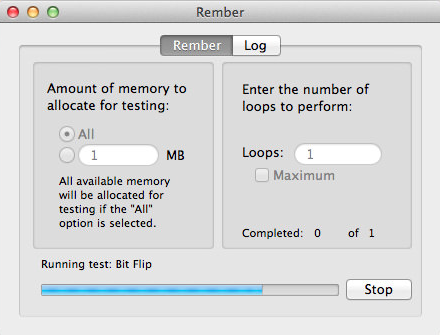 First of all, this RAM memory test tool is exclusively available for Mac users. 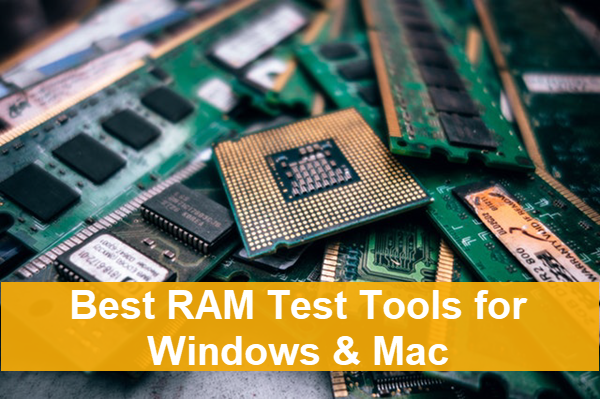 Windows and Linux users are not capable to use this RAM test Mac tool. There are several numbers of tests which this tool runs to check the memory thoroughly. And obviously due to several tests, it might take a long to complete the scan process. And once the scan process is done, your computer will be restarted automatically to fix the issues. There is a very less chance that the memory chips of MacBook get corrupted or get infected. The chips are made so specially by the Apple company so that if any error occurs, then users can fix that error automatically. And in case if the quantity of errors is more than expected, then just ask for the replacement of memory chip from the Apple customer support. Just like Windows Memory Diagnostic tool, this is a homemade testing tool of Apple which is exclusively available for Mac users. This tool is really a very great way to check all the hardware components as well as memory errors. It will also help you access to the Apple customer care support for further assistance. But before you contact with them, you can try to fix small issues at you own. This tool will suggest you the fixes which can be done to fix the issues. You can easily fix the issues using this tool. Moreover, the optimized features of this tool are really very amazing to use and access. That’s why this is one of the most popular tools for the Mac users. So, this is our last choice from over several tools which we had selected. We really hope that this tool will surely persist you to accomplish your task. Here this list of handpicked RAM memory test tools ends. This is not a very big list because this issue rarely occurs if you don’t replace RAM cards. But if you are one of them who is suffering with this issue, then use these tools to fix these issues. But we strongly recommend you analyze your PC’s hardware and compatibility with the RAM memory chip which you are going to purchase. You can leave a reply or can start a discussion below in the comments section. If you encounter with any problem with them, we will surely persist you in the best possible way.